Weekends we offer valet parking service for our customers. We invite you to the Wayne Steakhouse to enjoy a classic steakhouse experience rivaled by no other. Offering the finest cuts of USDA prime dry aged steaks seared to perfection, only the freshest of seafood, mouth-watering side dishes created to enhance the flavors of your cuisine, along with exquisite desserts topped with homemade schlage whipped cream and coffees to conclude your experience. Wayne Steakhouse has brought #1 Steak dining from NY to NJ. Wayne Steakhouse is the first and the only steakhouse in the country that offers free uncorking while you enjoy the finest cuts of USDA prime dry aged steaks! This is the 6th or 7th time I have eaten here and this was by far the worst experience I've had here. The food was very good, steaks a bit over cooked for what we had wanted but the main issue was service. Our waiter was not attentive at all. We were celebrating a 60th birthday and the birthday boy ordered an iced tea. About 45 minutes later we finally got the tea after asking the young busboy (he was actually more attentive than the waiter). Another solid experience... No need to drive to NYC for a top quality cut of beef. Tomahawk steak was on the money!! If you enjoy a good steak, Wayne Steakhouse should be on your list of places to eat. It will not disappoint. Both my wife and I had the 16 oz filet mignon, which were cooked to requested temperature. And the meat melted in your mouth. I've been there before and have had other steaks which were also fantastic. They could give a bit more attention to the care of their bathrooms. Besides that, perfect place and perfect meal. Everything was delicious! The filet mignon was perfect except for more fat than was expected. Made the mistake of not asking how much the appetizer was. Way too expensive! Liked the family style menu. Overall for the six of us, we enjoyed it. Great attentive staff. Menu sides are al a carte but enough to share at table of four. We love Wayne Steakhouse. The food is delicious and you can bring your own wine/beer. Perfect date night. The service was horrible. You had to actually beg for everything including utensils, and the restaurant ran out of food neglecting to tell the customers who were still waiting for their food. I would never go there again! Steak was awesome, melted in my mouth, I do think the waiter overcharged me $10 on the steak for 2 but I could be wrong. Was able to book a table for 2 late Saturday afternoon and basically waited like a minute when I got there. I would recommend for special occasions. Food was outstanding. Liked the decor. Our table was next to the door on the inside and every time it closed it was a little startling. More expensive than expected but because it was Byob helped with the cost. It was Valentines night BUT it wasn’t overly crowded and the service was horrific. We begged the waiter to take our order and the next time we saw her was when she gave us a check. Prices don’t match the service! poor service/Door banging wall near our table./ long wait for dinner to arrive. Food was good but totally overpriced for what you get. Service was ok but could be improved. Tables are way to close together. Service inattentive and slow. Only 3 other tables this sunday night, but we waited or had to ask for everything. Waiter after delivering steaks didnt come back to see how everything was. This is not acceptable in a steak house. Onion rings soggy, salad nothing to write home about. Lobster bisque had big chunks of tender lobster, but steaks only ok. The cuts were a bit rough for filets, and temperatures both rarer than we'd requested. The baked potato must have been rebaked from night before. At $7 for a potato, please give me a fresh one. Mediocre meal at best. I have eaten there many times and it has been great. Was disappointed this time. Service was really bad. We were pretty much ignored and our steak came out over cooked. Excellent meal, wonderful service! Will definitely be back. Wish it was in a bit of a better location! Everything was good as usual. My only comment is that the service was slightly rushed. Easily one of the best places in our area to get a delicious high end steak.. They continue to impress with the FREE house salad, onion rings and Whip Cream and berry dessert. BYOB.. can't beat the meal! We had dinner reservations at 7:30 for a party of six. When we arrived there was no hostess. What restaurant does not have a hostess in a Saturday night?! So it was first come first serve. The party of 8 were in line in front of us with a 8:00 reservation but remember there was no hostess. We were sat at 8:51. They are under staffed and the lady owner didn’t even come by to apologize. The food is great but come during the week or if you have to in weekends, come before 6. Trust me. There was no host/hostess. Customers were left to seat themselves in a free-for-all type of situation. It was complete chaos and really set the tone for the evening. We and several other tables voiced our frustrations with manager and he could care less. In fact he defended their terrible service, and so did our waiter. Not to mention it was uncomfortably cold in the dining room for he entire time we were there. Overall terrible experience and I would never return, not even on a “less chaotic weekday”. The food was great, staff attentive, and the place was packed. A downside was that all of the people waiting to be seated were piling into the front area creating a constant draft into the restaurant with the door open. It being winter, it took away from the experience. Will definitely be back nonetheless. Not happy to be seated at the awkward 2-person table by the door where everyone stares at you through the window coming in and where it’s cold. Seems to be an all-around annoyance to other people, too. I also don’t think they do the strawberries and cream anymore. Kind of disappointing but the food was great otherwise. Food was very good. Steaks were cooked perfectly and enjoyed by all. Benefit is its a BYOB. No kids menu, but they did offer to make Penne. House salad and onion rings are complimentary. Salad dressing was delicious. Creamed spinach was just meh. Calamari was a nice starter. Little pricey for a NJ steakhouse, but quality of food was spot on. Would defly return. We usually celebrate our birthdays there. This time we just wanted to treat ourselves after hard day of Christmas shopping. lol Our waiter is the best, he remembered us on our 2nd time there. 😊 He's not bad on the eyes, either. lol jk. He's married and has a new 👶. We're so happy for him. Sweet genuine, funny waiter. The food was good. The prices were very diff online than there. It was cold in the restaurant. The steak was a little salty. The onion rings were soggy. Asked for 2 cokes they never came. Wasn’t charged but still. Waiter was very attentive and helpful since it was my first time dining here. Unsure if we will go back though. If zero stars was an option for this meal I would give it zero and all because of the owner (owners wife I heard too) ! 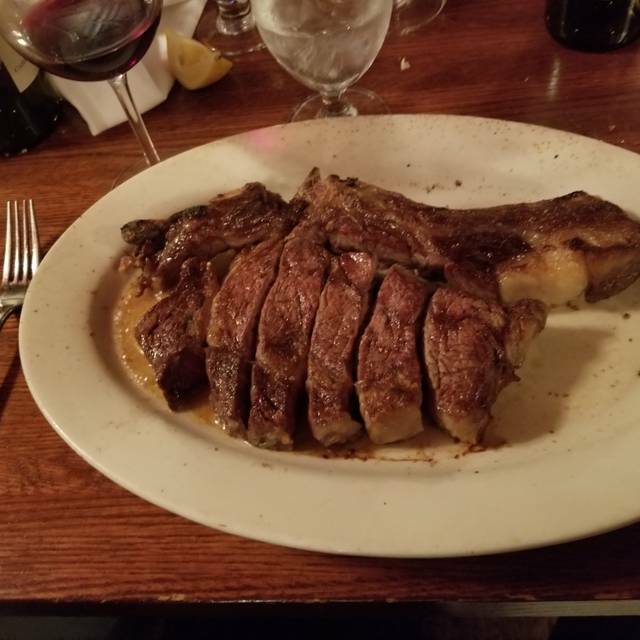 Lets me first say that I have enjoyed the Wayne steakhouse for the last few years since moving to Wayne.I have recommended it as knock off of Peter Lugers in Brooklyn and that is one of the places I most enjoyed while living in Brooklyn. It is also a BYO which as an avid wine drinker allows me to dip into some very nice bottles of wine without having to pay restaurant retail prices. The night started well with appetizers arriving on time and tasting as they should. We ordered the steak for four and some sides. The steaks came out and I pulled some meet to my plate as I took the first bite the meat had a slight odor to it as I put it into my mouth I realized the meat was rancid, disgusted I spit it out to the plate. We explained to the waiter and he retrieved the plate to the kitchen, what happened next was the worst handling of a situation in hospitaility history. The owners wife came out and started telling us we were wrong that the meat was fine and she would not send us another steak, at this point the table next to us overhearing the coversation agreed with us and told the woman. She snapped at them saying "your opinion doesnt matter at this table". The table was baffled and confused, the steak was clearly bad, i asked her to try it, smell it and she refused. We explained we just wanted another steak to replace it, she refused and said ill comp your dinner and you need to leave, it was the oddest thing i have ever experienced. Here was the owners wife, who could have said sorry let me get you another steak instead comped our dinner??? She lost more money by comping than replacing and lost four customers that are repeat diners! This owners wife is terrible, and most of the waiters came over and apologized and talked behind her back saying she is crazy and were scared of her, its a real shame! The best steak we ever had and we have been to all the top steakhouses many times. USE CAUTION! Very good food and nice atmosphere, but 2 lessons were learned from this dining experience. I sometimes will ask for the price when ordering an off menu special, but I didn't this time. NEVER AGAIN! Both my guest and I each ordered specials. With most of the entrees in the $40-$50 range, my anticipation was that these specials might be as high as $60. Don't you think the waiter, (who identified himself as the manager but is just as likely the owner), should inform the diner when the special's cost is $99.99?? It was a delicious surf and turf, 16 oz. filet + 16oz. 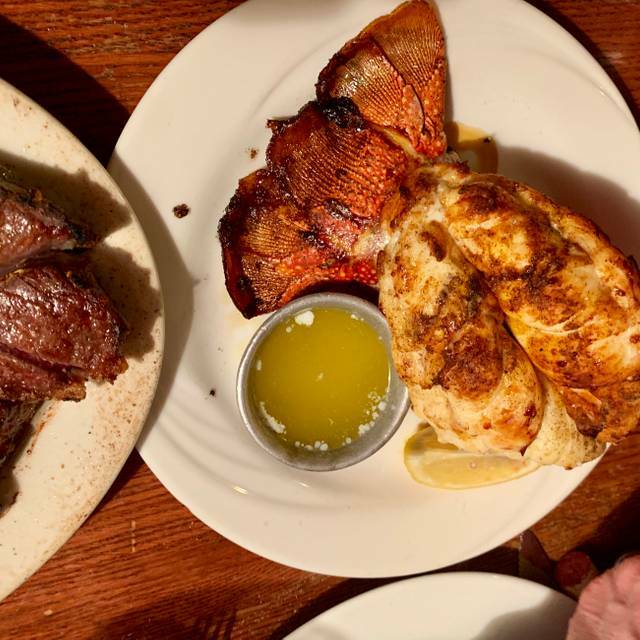 lobster tail, and perhaps the cost wasn't totally unreasonable, but when the cost is over 60% higher than expected, not informing me strikes me as shady, particularly so that when I questioned the waiter about it, he responded that he thought about mentioning it but decided against it. We had to wait over an hour and a half for a table. Two groups of 12 were dining and their reservation was only for 2. The wait staff worked as best they could to accommodate. The existing diners were not very cooperative as they could see people waiting and they stayed talking even after they paid. The food however was very good. Great steaks & service. We had a fantastic time with dear friends. We all enjoyed the steaks , oysters, and other appetizers. Food was just ok. I would not rush back. Overpriced steak. We had a good meal but there were little bugs flying around ,,we asked our waiter for a candle so they would go away and he said they had none and that it must have been a bug left from the summer..So to me they were little fruit flys and there were all over .